The only reality about this world is the present moment. You can only hold that much. Whatever you hold other than that is an illusion or Maya. That illusion may manifest in your life in various forms like the heads of Ravana. If you do not recognize it and deal with it, eventually, it will leave you deluded and distracted. Maya or illusion is an important concept in both Buddhism and Hinduism; and understanding its essential nature is an important aspect of progress on the spiritual path. 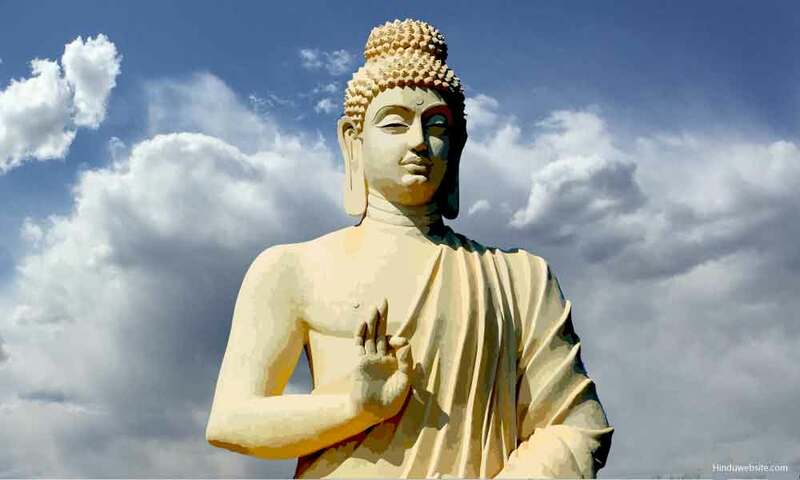 In Buddhism the concept led to the notion of emptiness of things and in Hinduism to the notion of Brahman as the only absolute and eternal reality that exists beyond all names and forms. Both agree as to the ephemeral and empty nature of mortal existence but differ with regard to what lies beyond. In Buddhism there is nothing beyond the illusory nature of life. One has to deal with it and escape from it. In Hinduism the True and Eternal Reality of Brahman exists beyond the illusory world and one should strive to reach it. We entertain a lot of illusions in our lives, illusions about things, about people, about outcomes, about relationships, about ourselves, our knowledge, intelligence, abilities and achievements. These are the illusions we create with our thoughts, beliefs, reason and association. Then there are illusions that are larger than you, your life and this world about which you may not be even aware. Thus we are illusions within an illusion and not even aware of it. We are creators of it and victims of it. If you do not trust me, look back at your own life and your relationship with the world. We both live in the same world, but is your world same as mine? Do we perceive the events in the same manner? How much is that world we know is our creation and how much is it real? Where was the world that you lived yesterday, a week before, a month or year before? Did it even exist the way you remember it now? Where are those objects, streets, people, events, and circumstances that manifested in your life when you were a child, when you became a teenager or when you grew up to become an adult? Where are you, that young and youthful person, full of hope and aspiration, eager to break free from the mold of your parents and tradition? That world and those things that existed before, now exist only in your mind as memories. Even that you cannot be sure because your memories are covered up with many other memories and might have even got corrupted to the extent that what you remember now about your past may be largely your imagination, expectations, desires, and fears. In what sense this world is an illusion? It is also an illusion because you cannot recreate the world in which you lived. What cannot be recreated, even according to science, is false. It is strange that science always looks for repeatable evidence to establish truth, but ignores a major truth about life and existence itself - that it is not repeatable. Past cannot be proved except in theory, and through testimony, inference and belief. If something is true, you should be able to recreate it. What is true and real does not undergo change and alteration. It is always the same, like numbers, equations and universal laws. The world in which you live and the circumstances through which you pass are created by a combination of factors or variables. Even if one of the factors is missing, the world disappears or appears differently. Thus, the world that you saw yesterday cannot be recreated because you cannot move back in time and recreate all the conditions. Even if you somehow were to move back in time, the world that you will experience will be different from the world in which you lived because certain factors may still be missing. Hence, time travel, if at all it becomes a reality, can only take you into possibilities and alternative realities rather into the past you experienced before. You may think that you, the person who spent the whole day yesterday is the same as you the person who is now living through this day. But if you think deeply, you will realize that many things happened during the interval within you and outside you that made it impossible for you to be the same. The changes may be very minute. But they are changes that are bound to have consequences and lead to further changes. Each day you wake up, you meet a stranger in you whom you totally ignore and pretend as if he were the same person you knew for ages. Each time you meet a person, you ignore the person and look at the image of that person you have already created in your mind. You do not meet people, unless you are very mindful and trained your mind to be in the present, but a projection of your own thoughts and images of them. We make certain experiences recurring, whereas in truth no two experiences are alike. These are the little tricks to which our minds resort to avoid spending too much time and energy on non-essential things. Even your notion of you is an illusion, because out of trillions of pieces of memories you have gathered in your life only a few choicest ones you remember and piece them together to create a persona which you consider you are. The truth is, it is just a virtual image of memories, brought together into a formation by desires, not you. Your mind connects the events it wants to remember ignoring the rest and creates its own version of reality. You are that reality. A ghost image of your projection. A belief structure, sustained by hopes and desires. You remember only certain things about your life and you put them together to create a personality. In truth there is no personality. There is no person. You create that person and that personality to make sense of the world, relate to it and experience it. You set aside all that which is troublesome, and which is likely to disturb others or attract their disapproval. You even embellish that notion of you with imagination and distortions to create a person that is not actually you but what you consider you should be. You are an illusion as long as your personality is gathered around a core of desires and expectations and it ignores a vast portion of your experience and awareness. Your experience is real to the extent you are absent and an illusion to the extent you are actively driven by your desires and expectations. Hence we have so much difficulty in understanding ourselves and knowing ourselves. We have so much trouble connecting with others, trusting them or being trusted by them. Just as you are not real, the people you deal with are also not real. They are the shadows of the truth hidden in them. This is not cynicism, but truth. We do not deal with real people. We deal with the images people project. We deal with desires and expectations in the form of people and relationships. And rarely we see ourselves or others as they are, without we standing in between. Illusion (maya) means mistaking one thing for another, holding on to something to be true, which in reality is not, like mistaking a snake for a rope or a rope for a snake. Illusion also arise when you cannot trace the effect to its cause or when you trace to a wrong cause. This confusion arises from ignorance or lack of knowledge and intelligence. The illusions may last for a brief moment like a dream world or for a lifetime or for several lifetimes like the material world itself. Whether they are long or short, they are still illusions and influence our thinking and actions. One of the major illusions from which we suffer is about the permanence and continuity of our experiences and our living. For example, you may consider an event like your drinking a cup of coffee or going for a walk with a friend is repetitive and can be re-experienced; but the reality is each experience is a unique and time specific bound to certain specific circumstances. You may repeat the event, walk on the same rutted path, but the experience and the circumstances will not be the same. Each experience in your life happens only once. No matter what, you cannot recreate it exactly as it happened. Even if you make it happen through a computer simulation, your state of mind will not be the same. You may eat the same rice in the same bowl everyday and day after day, but in truth each day is different and each bowl of rice is different from the previous one. The repetition of any event in our lives is an illusion because we chose to ignore the differences and focus upon the similarities to avoid feeling overwhelmed by the details. A mountain or a tree may give us an illusion of continuity, since these objects have a longer lifespan and undergo changes gradually; but if you observe carefully, you will realize that even they undergo changes constantly, and are never the same. Even the earth is not the same always. Existence that which has a beginning and an end, which undergoes constant modifications, which is called Samsara in eastern philosophies, is an illusion created by the coming together of certain events, factors and things. Take them away and you have a different reality. Life is thus a flux and that flux is largely an illusion with its constantly changing vistas. Those who seek permanence in this flux get into trouble because they want to hang on to things and relationships that keep on changing. In this medley of life, either you adapt to the changing circumstances with wisdom, accepting them as they are, and move on or you will get into trouble like a person who want to stay in her house even when a deluge is coming. If circumstances overwhelm you, there is no point in crying about it. That is life speaking to you in its mysterious ways and bearing its soul to you, telling you that you cannot take it for granted, and that to escape from its fangs you should keep moving on without turning back. If you are in a river full of flood waters, you must stay afloat in it, unless you want to drown, and you must try to swim in the right direction, without entertaining any illusions of owning it or controlling it. That is the wisdom and truth about life. You live it, without having any illusion about your relationship with it or your control over it, until you reach a safe place where nothing can hurt you. This is the truth about earthly life. It is a seemingly random process with a hidden structure, a forward only movement with some method in the madness that manifests each moment as certain things and forces come together and create a drama in motion, a life in flux. Life is created anew each moment, but we are not aware of it. We believe that it is a continuation. The continuity itself is an illusion, just as the world itself. Most of us are bored with life, when it becomes a routine. But actually there is no routine. There is no continuity. Both are illusions. Each moment is different from the previous one. The boiling water is a good example. The water may be the same, but the bubbles that arise in it are never the same and each moment the water loses some mass in the form of vapor. So is the case with the ocean and its rising and falling waves. So is the case with our minds, with their plethora of emotions and modifications. So is the case with our relationships, our actions, our thoughts, our desires, and feelings. This leads to a few important conclusions as to how to deal with world and not be bound by it. Life is an illusion, but that does not mean that you have to end up in despair and take up the life of a monk. There is every reason to rejoice in it because you are put on a stage by mysterious circumstances and you have been given an opportunity to experience being and becoming, which are in themselves unique. Imagine, even if one ancestor out a millions of ancestors in your family tree were missing, you would not have been here today. If even one factor out of innumerable factors were missing, life would not have manifested upon earth. If one process, out of millions of historical processes that shaped our civilization would have been missing, our lives and existence would have been different. Therefore, your life is precious and unique. The odds of you living it again are nil to none. Therefore, rejoice in it and make the best out of it. Live your life fully, but do not form attachment with the world, with people and things to which you cannot hold on, things which you cannot bring back to life or recreate. You are in the flow of life. Wisdom is to flow with it, rather than resist it or swim against it, unless you love the pain and the exhaustion. Each moment life happens to you. Let that happen, doing whatever you can not to stand in its way, without getting overly attached to the gifts it brings. Flow with life and be part of it. Discover its destiny and purpose, rather than getting stuck in your own dreamland of memories and fairy wishes. This is important. You have to be absent in order to be present. If you want to be free from illusions, you must deconstruct the illusory self you have created by realizing how much illusion you have built into it and around it in the pursuit of your dreams and desires. For that you have to accept that your self-identity is an illusion, a mere aggregation of certain thoughts and memories, which you assembled around a core of desires, habits and conditioned thoughts to deal with the world on your own terms. This person, who you think you are, does not exist. You created it, the myth which you are. You are holding on to this construction as you, whereas it is just a mental formation which you use to relate to the world and find acceptance and approval. You not only create this mythical person from the day you are born, but you also do everything in your capacity to nourish it and keep it alive. You defend it and protect it by all available means. You are its creator, its upholder and you alone can be its destroyer. The truth is by holding on to this self-image, you limit your choices and the possibilities of leading a more fulfilling and unconditioned life. You can set this illusion free by understanding how you created it and brought it to life. You can do it by expanding your field of awareness, increasing your knowledge and wisdom, becoming mindful of your thoughts and feelings, suspending your judgment and accepting the totality of your life as part of you instead of a few select memories and thoughts. You can do it by observing it, staying apart form it, releasing yourself from it and becoming a witness. That is real freedom. That is nirvana. That is entering into a zone without limits, becoming a reality that is not defined by experience, not created by desires and expectations, not tortured by judgment, not sustained by hopes and aspirations but exists by itself with awareness, understanding, knowledge and existence itself, without boundaries, fear and expectation.